The Republicans have 23 seats at stake in 2008 and the Democrats have just 12. Nevertheless, many of these are safe seats, so the numbers don't tell the whole story. Below are the races expected to be competitive. The map-generation software was never designed to handle two Senate races in the same state at the same time, so in Wyoming we are tracking only Sen John Barrasso's seat and in Mississippi only Sen Roger Wicker's seat. It is virtually certain that Sen Michael Enzi (R-WY) and Sen. Thad Cochran (R-MS) will be reelected as they won by huge majorities in 2002 and have weak opponents in 2008. For purposes of keeping score, Sen. Joe Lieberman (I-CT) and Sen. Bernie Sanders (I-VT) count as Democrats. Since Lieberman spoke at the Republican convention, he might be booted out of the Democratic caucus in January, but for the time being he is de facto a Democrat. Click on a state for a graph of the polls for that race. Click here for a single page with all the senate graphs. See also our list of all 2008 Senate races and also the hottest 2008 House races. (D) When he was first elected in 1996, Sen. Wayne Allard (R-CO) promised to serve only two terms. True to his word, he has announced he will not run for a third term. Colorado has been trending Democratic in recent years. While George Bush carried the state by 6% in 2004, Colorado also elected Ken Salazar (D) to the Senate the same year and just elected Bill Ritter (D) governor by 15%. Furthermore, the Democrats control both houses of the state legislature. Colorado will be the Democrats' number 1 target in 2008. Rep. Mark Udall is running for an upgrade to the Senate. He has a very strong environmental record in this environmentally conscious state. The Republican is former Rep. Bob Schaffer. Schaffer ran for the Senate in 2004 but lost to Pete Coors in the Republican primary. Polls show Udall way ahead. (D) Sen. Saxby Chambliss (R-GA) ran an extraordinarily mean-spirited campaign in 2002, accusing decorated Vietnam veteran and triple amputee Max Cleland of lacking patriotism. Chambliss also paired pictures of Cleland with Osama bin Laden and Saddam Hussein. Chambliss won by 7%. This time he faces another Vietnam veteran Obama's massive voter registration drive registered many new Democrats and this may benefit Martin. Indeed polls show it to be surprisingly close. (D) Although Democrats picked up a House seat in Kentucky in 2006, the state remains fairly conservative. Sen. Mitch McConnell (R-KY) matches the state well and as minority leader in the 110th Senate will wield considerable influence. Nevertheless, he is facing an extraordinarily strong challenge from wealthy businessman Bruce Lunsford. McConnell trivia: his first name is Addison but he goes by "Mitch" (his middle name is Mitchell). Despite the separation of powers mandated by the constitution, McConnell is intimately intertwined with the executive branch: he is married to Secretary of Labor Elaine Chao, the only member of the original Bush cabinet still in office. (R) Mary Landrieu is one of the two Democrats who barely squeaked by in 2002, having won in a runoff with 52%. The Republicans have her in their crosshairs. They might try to blame hurricane Katrina on her (or more specifically, her response to it), but that would be playing with fire as she would would likely then blame the Republican administration. Her net approval rating is +10%--not great--so this is one of the Republicans best chances for a pickup. Her worst problem is that hundreds of thousands of people, most of them Democrats, left the state after the hurricane. Her opponent is state treasurer John Kennedy, who recently switched from the Democratic party to the Republican party to run against Landrieu. However, most polls show her winning the race. Landrieu trivia: Her father, Moon Landrieu, was mayor of New Orleans from 1970 to 1978, and her brother is the current Lt. Governor of Louisiana. (D) Sen. Susan Collins (R-ME) represents a dying breed: moderate Republicans from the Northeast. New England used to be run by them, but they have suffered major losses in recent years. Collins is personally popular, but so was Sen. Lincoln Chafee (R-RI), and it didn't save him. Also working against Collins is her 1996 pledge to serve only two terms, something she repeated in 2002. She recently decided to break that promise and run for a third term. Her opponent, Rep. Tom Allen from ME-01 (who already represents half the state in the House), will undoubtedly harp on the broken promise. This seat was expected to be competitive, but Collins has run a strong campaign and will probably be reelected. (D) Sen. Norm Coleman (R-MN) will be the Democrats number two target in the Senate in 2008. He won his seat in 2002 by a tiny margin after his Democratic opponent, Paul Wellstone, was killed in a plane crash two weeks before the election. The Democrats hastily got former Vice President Walter Mondale to take Wellstone's slot on the ticket, but he wasn't able to jump in and win. Both parties are keenly aware that in Nov. 2006, Hennepin County Attorney Amy Klobuchar (D) crushed Rep. Mark Kennedy (R) by over 20% for an open Senate seat. Comedian Al Franken is the Democratic nominee. Remember, this is a state that elected a pro wrestler as governor. Franken is good at zingers, which people remember, such as "I'm the only New York Jew" in this race who actually grew up in Minnesota." Franken has also tied Coleman to Bush very well and Franken is leading in many of the polls. 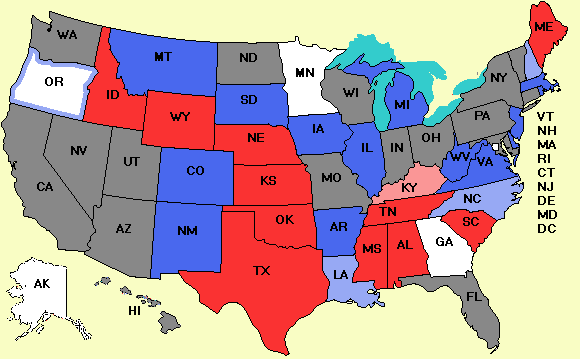 (D) Sen. Trent Lott's surprise resignation has opened up the other Mississippi Senate seat in 2008. On Jan. 1, 2008, Gov. Haley Barbour (R) named Rep. Roger Wicker (R) of MS-01 to fill out the seat until the end of the 110th Congress. Wicker will have to stand for election in a special election. Former Mississippi governor, Ronnie Musgrove (D) has announced he will contest the seat. Although Mississippi votes Republican for President, Democrats control both houses of the state legislature. Furthermore, the incumbent has never won statewide election and the challenger has. Expected to be quite close. (D) Sen. John Sununu (R-NH) had not really been on the radar until Nov. 7, 2006, when a political tsunami hit New Hampshire. Gov. John Lynch (D) was reelected with the largest margin in state gubernatorial history at the same time two totally unknown Democrats knocked off the state's two sitting Republican House members. The Democrats also swept to power in both houses of the state legislature for the first time since 1874. In this environment, the rematch between three-time governor Jeanne Shaheen (D) and Sununu is likely to be very different than Sununu's 2002 4% victory over Shaheen. Early polling gives Shaheen a double-digit lead. Sununu has the additional burden of being a strong supporter of the war in Iraq, a highly unpopular position in New Hampshire. At this point, the seat leans strongly Democratic. Sununu trivia: Sununu is the youngest member of the Senate and his father was governor of New Hampshire and Bush 41's chief of staff. (D) New Mexico is truly a swing state. In presidential races, it is split right down the middle. It also has one Democratic senator (Jeff Bingaman) who wins in landslides and one Republican senator (Pete Domenici) who wins in landslides. Under normal conditions, Domenici would be a shoo-in for a seventh term, but in Oct. he announced his retirement due to brain disease. After a bruising primary, Rep. Steve Pearce won the Republican nomination. On the Democratic side, Rep. Tom Udall (cousin of Mark in Colorado) is the candidate. This means that all three of New Mexico's congressional seats are open as well as the Senate seat. The NRSC has announced that it won't be spending any money in New Mexico, which means they concede the seat to Udall. (D) Sen. Elizabeth Dole (R-NC) did a spectacularly bad job as head of the NRSC recruiting strong senatorial candidates to challenge weak Democratic senators, such as the Nelson boys. Will the people of North Carolina blame her for losing the Senate? Probably not since most people (except politicians and political junkies) have never even heard of the NRSC. On the other hand, they have definitely heard from the DSCC which has been running an ad all over the showing two old geezers in rocking chairs discussing the fact that Dole ranks 93rd in Senate effectiveness. Her Democratic opponent is state senator Kay Hagan. Dole was the favorite, but the ad has evened it up. Dole trivia: Her husband was a long-time senator from Kansas and the losing Republican presidential candidate in 1996. Then he switched from elections to erections and became the national spokesman for Viagra. (D) Sen. Gordon Smith (R-OR) is a moderate senator in a state that is fairly Democratic. Although he won by 16% in 2002, his net approval rating is only 11%. His opponent, state House speaker Jeff Merkley (D), could run the same campaign against him that Sen. Sheldon Whitehouse (D-RI) ran against former senator Lincoln Chafee (R) in Rhode Island: "Smith is a nice guy but do you want Mitch McConnell to be majority leader?" This seat is definitely a Democratic priority. (D) Sen. John Warner (R-VA) has decided to retire after his term is over in Jan. 2009. Former governor Mark Warner (D) is the Democratic nominee. Warner is young, attractive, and made about $200 million as a cell phone entrepreneur, so he can finance the campaign himself. The Republican nominee is former governor Jim Gilmore. Troublesome for the GOP is that the Northern Virginia suburbs, which are heavily Democratic, are growing rapidly and led to the election of Jim Webb (D) as senator in 2006 and Tim Kaine (D) as governor in 2005. Warner's retirement has suddenly made Virginia a very likely Democratic pickup in the Senate. Even though the last Democratic presidential candidate to carry Virginia was Lyndon Johnson, due to the changing demographics, in 2008 it will be a huge battleground.